I’ve always thought that ridicule is the one of the greatest “Distort the truth” tricks or perhaps one of the greatest “Avoid the Truth” tricks known to man. When a legitimate question is presented you can quickly diminish it by making it funny. We call it “laughing it off”. For example, if you warn a smoker that smoking cigarettes can cause cancer, they can avoid the truth by making the truth into a joke. I admit, I sometimes have trouble facing certain truths and as a result I have a tendency to “clown” things up a bit. I’ve been working on trying to resist that tendency which, interestingly enough, switches into the alternative tendency for distorting/avoiding the truth – the emotional response. Once I decide not to clown it off, I’ll have an urge to get emotional to the question at hand. Perhaps angry or hostile to the question. If I get past those barriers I get to the denial and rationalization phase. But if I can get past denial and rationalization, I’m finally at the place where I should have started in the first place – reason and logic with an open mind, even to where I can challenge my own faith and perhaps even my core values with an open mind. Reaching conclusions can often be like trying to get to the other side of a stream by jumping from rock to rock. Many times people will tell me I’m standing on the wrong rock, but when I look down there’s no other rock to go to. I guess what they are really saying is just jump in the stream like the rest of the world does and get washed away. When the question is presented on whether or not there is a Living God, it’s assumed by many that you have to take a blind guess and live by it. I prefer to challenge that question a little harder. If God exists and the scriptures are true – then He will eventually answer when I pray. 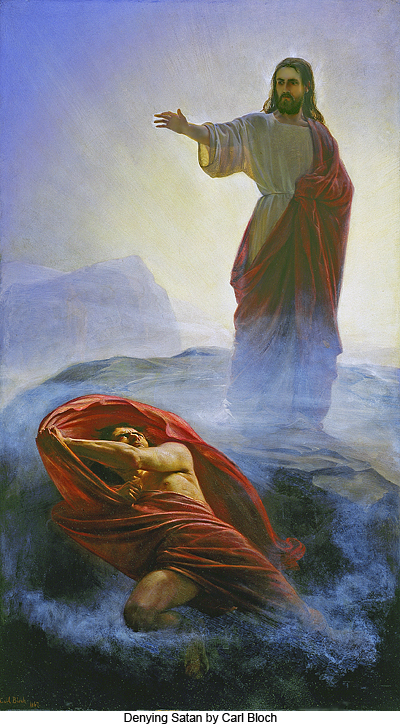 If there is a Christ and His atonement can heal us – then we should be able to easily measure its healing effects. If I fulfill the requirements as given in the scriptures and these things don’t happen, then the conclusion must be the scriptures are false. There are many reasons why we should strip ourselves of pride and seek the truth on whether or not God lives. One of them is particularly important for us today; if God does live then we can turn to Him for protection from evil, assuming we obey Him. There are many examples throughout History where this has been true, one of the greatest examples is where God delivered the Israelites from Egypt through Moses. Since I am currently studying the Book of Mormon, I will turn once again to the Nephites and Lamanites in 3 Nephi Chapter 3. This takes place in Central America during the same time Jesus Christ was in his teenage years in Jerusalem (about 16 AD). Many of the Nephites have once again dissented from the truth, by mocking the idea that there is a God or a Christ and falling down the slippery slope of political correctness and worldliness until they are once again under a great threat of being destroyed by a quickly growing enemy called the Gadianton Robbers led by Giddianhi. So great was the threat that the Lamanites and Nephites finally chose to unite together. The letter that Giddianhi wrote to Lachoneus, the governor of the land has a familiar tone to it. See if verses 9-11 sound like something in our political discussions today. Once again, out of fear, the Nephites repented and prepared themselves for what was to become a violent war against them. The battle was described as the worst the people had ever seen, even since their forefathers had arrived from Jerusalem 600 B.C. Because they united and repented they were spared, but at a great cost. The world today has to answer the same questions. Will we continue to follow the path of evil until evil turns around and threatens us or should we put aside the ridicule and denials and face the sobering question – should we turn to God? It’s better to address that question now than later. You can read along and listen to the conclusion here in 3 Nephi Chapter 4. This entry was written by Matthew Rossiter, posted on June 3, 2011 at 9:07 am, filed under Celestial. Bookmark the permalink. Follow any comments here with the RSS feed for this post. Post a comment or leave a trackback: Trackback URL.